From BC’s winemakers, the consensus seems to be that 2017 was a more normal growing season compared to the two previous seasons. Although there were horrible wildfires, the fires occurred in early summer, not later in the summer when veraison occurs. Smoke seems to be more problematic for grapes at veraison. The smoke earlier in the summer filtered the sunshine which positively impacted the growing season by slowing down the rate of grape ripening and flavour development. Winemakers note that in the Okanagan the berry size and cluster size were smaller which produced less juice. They also describe the 2017 vintage as producing crisp, fresh whites and elegant reds; Slightly lower alcohol levels and lower pH (higher acidity). Some said that the tannins in the red wines are rounder and softer. In the Similkameen Valley there were two months of no rain during the growing season and lots of sunshine, but still cooler than the previous two years. Lower fruit yield but great fruit quality. A great vintage for the Similkameen. Vancouver Island and the Gulf Islands had a slow cool Spring start, with bud break nearly a month later compared to 2016, but then the sunshine and temperatures increased allowing perfect conditions for bloom and fruit set. veraison was later in August, but the dry heat in the region continued into September to allow full ripening. High grape yields, with some vineyards setting all-time records. Expect a great vintage. In the Kamloops region, it was a hot summer. The smoke filtered the sunshine there, just as it did in the Okanagan so saved the region from getting too hot in the summer. The winter preceding was very cold, which caused some bud loss, so the 2017 yield was down, but the quality of the fruit was great we are told. Further west in Lillooet, there was some smoke as well, but it lasted only a few days and then blew away and was not a factor. They had smaller berries and clusters, again resulting in lower juice yield in many cases, which concentrated the fruit flavours. More quality wine to be expected. So look out for the 2017 BC white wines this Spring and Summer, and the reds to come out starting in the Fall and into the next few years, depending on the oak ageing regiment. As part of this discussion with BC winemakers about the 2017 harvest, I and other wine trade people had a chance to try some 2017 white and rose wines, and hear about the wines from the winemakers. Below are a few of the wines I enjoyed. Quails’ Gate B.M.V. 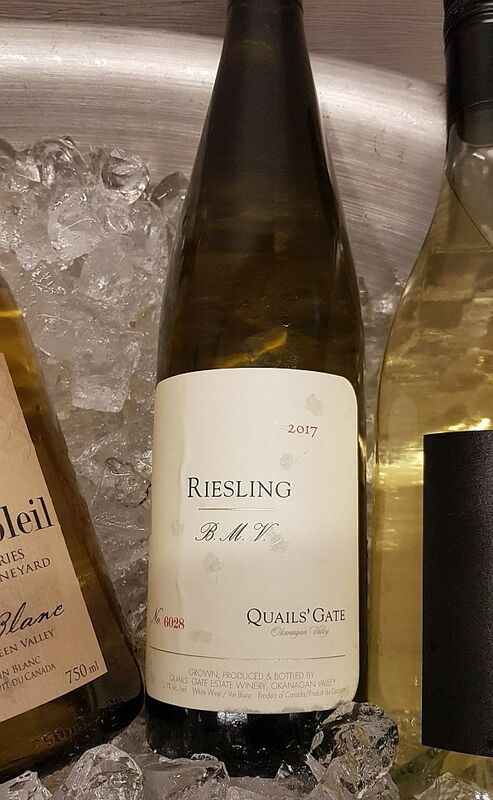 Riesling 2017 – A barrel-fermented Riesling; new for Quails’ Gate. The grapes were whole cluster pressed, then the free-run juice was racked off to neutral oak barrels where it underwent wild fermentation then stayed another 2 months on its lees. The wine has a medium bright lemon colour. Ripe stone fruit nose. Off-dry with higher acidity. Roundish. Tart stone fruit, a hint of citrus and salty minerality. This wine has some body, which you feel in your mouth. Delicious. Haywire Gamay Rosé 2017 – Gamay produces an easily drinkable wine in BC, and a rosé even more so. A dry rose with residual sugar at 1.6 g/l. Medium intensity reddish orange in colour. Very aromatic; lifted red fruits and strawberries. Medium bodied, higher acidity with some prickle. Dry. Flavours of red fruits with red cherries behind. Red fruits, with some herbal mixed in on the finish. A fresh wine. 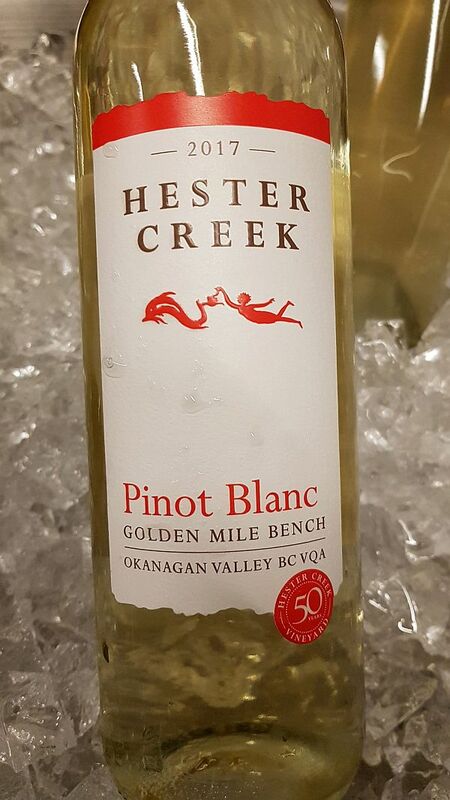 Hester Creek Pinot Blanc 2017 – The grapes come from their Blocks 4 and 9 on their estate, located on the Golden Mile Bench. The winemaker noted that Block 4 tends to provide a baked apple flavour while Block 9 provides citrus. This wine is pale lemon in colour. Aromas of lees, crisp apples and peaches. Medium plus body, medium acidity with some prickle. Slightly off-dry. Flavours of peach and apple up front followed by pears on the mid-palate and pepperiness and stoniness on the finish. A Pinot Blanc with character. 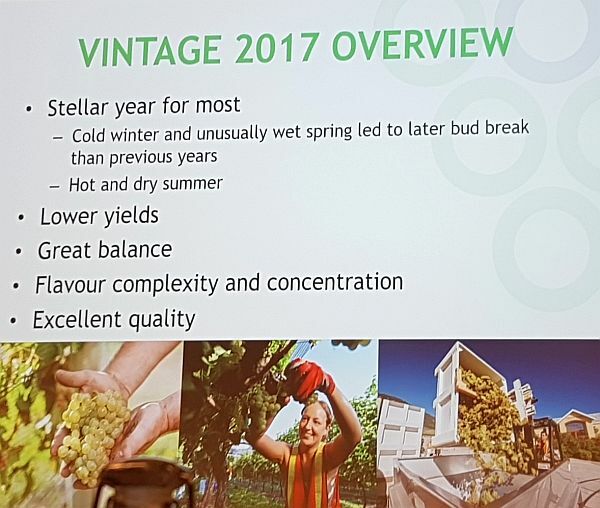 Roche Wines Arôme Schönberger 2017 – This is the second year for this wine and they are still learning about how to grow and when is the best time to pick this grape. Were told that this unique grape, grown in BC and not too many other places in the world, is good to add to other wines to brighten up the aromas and flavours. It is quite interesting to note that this wine has a residual sugar level of 1.3 g/l, and this is their sweet wine! Deeper bright lemon in colour. Lots of range, floral and some stone fruit on the nose. Medium plus body, off-dry, round and soft. Medium acidity. Mainly orange flavour, but also some stone fruit. Medium length. Drink Good Wine. That is my motto and I really want to help you drink good wine. What is good wine? That can be a different thing for each people. Food also loves wine so I also cover food and wine pairings and restaurant reviews. MyWinePal was started by Karl Kliparchuk, WSET. I spent many years with the South World Wine Society as the President and then cellar master. I love to travel around the world, visiting wine regions and sharing my passion for food & wine with you. Come live vicariously through me, and enjoy all my recommended wines. We all want to drink good wine, but sometimes we need help picking a wine. Within this website you will find free information to help you purchase wines from around the world with confidence. If you have any comments or suggestions on how to improve MyWinePal, please let us know. We value your feedback. Cheers. Karl MyWinePal BrandYourself Profile Karl MyWinePal is on BrandYourself.com. Check out his profile. Copyright © 2019 MyWinePal. All Rights Reserved. The Magazine Basic Theme by bavotasan.com.